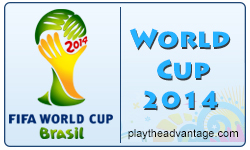 Play the Advantage and the World Cup: Live on Twitter! It turns out I have a reprieve from The Day Job for the entire World Cup. (I know, right? Best. Boss. Ever.) So, while I won’t be in Brazil, I’ll be on Twitter every day for every game, and I want you to be right there with me! Yes, I’ll be bringing my particular blend of refereeing commentary and sass (mostly sass) to every game live at @PTABlog. Every time I say “Oh, my God, Switzerland!! !”, you take a shot. Don’t miss the fun! Follow me at @PTABlog on Twitter.